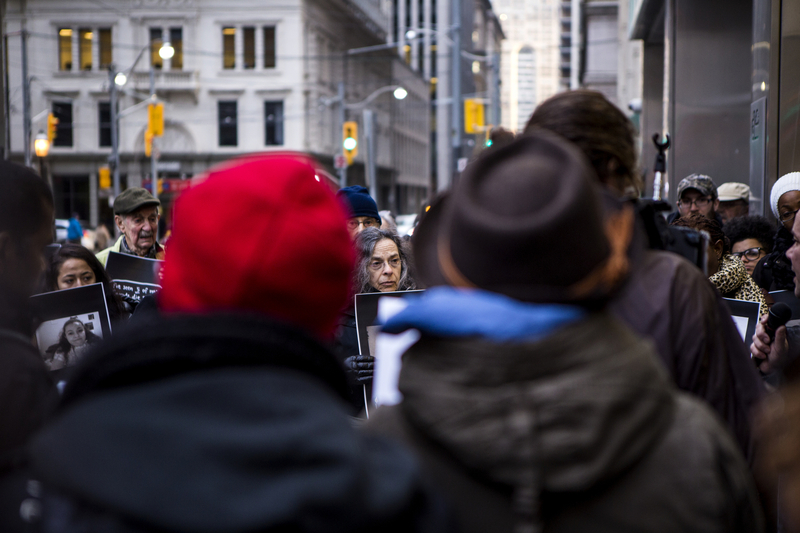 Dozens of people met outside the Immigration and Refugee Board of Canada offices in downtown Toronto on Tuesday evening to hold a vigil for two immigration detainees who died in custody less than a week apart. The activists called for changes to the Canada Border Services Agency (CBSA) which currently has no time limit on holding immigrants in custody while resolving legal issues. Since the year 2000, 14 people have died while inside a system that Amnesty International has called a "legal black hole." "If they can't keep our people alive they shouldn't be keeping them at all," said Estefania Alfonso Falcon through a megaphone to the crowd of about 50 people gathered in front of the office's glass doors on Victoria Street. Melkioro Gahungu, a 64-year-old man from Burundi who suffered from mental illness, hanged himself at the Toronto East Detention Center on March 7. He had served a full sentence for manslaughter before being taken into CBSA custody. Six days after his death, Chilean immigrant Francisco Javier Romero Astorga was found dead in his cell at Maplehurst Correctional Complex in Milton after he had been deported from Canada and returned. "When I heard the news that Melkioro died and then again that Francisco died, I was in a lot of pain," Falcon told VICE News. She is a member of No One Is Illegal Toronto and End Immigration Detention Now, two activist groups that are focused on problems with immigration detention and that organized the vigil. "We've never lost people this close together," she said. Among the crowd were members of local worker unions and human rights groups. At times, people chanted slogans such as "not one more," and "end immigration detention." Some participants held candles in small plastic cups while others held posters depicting the faces of others who have died in custody, including Jan Szamko who fled persecution in the Czech Republic and died in December 2009 in Toronto, Lucia Vega Jimenez, a Mexican migrant who committed suicide at a Vancouver institution in December 2013, and Abdurahman Ibrahim Hassan, a Somali immigrant also known as 'Abdi,' who died in Toronto last June. Macdonald Scott, an immigration consultant for Carranza LLP who works with No One Is Illegal, said that Canada is a "rogue nation" compared to other countries such as the United States, as the CBSA has no overseeing body. One of his clients, Cameroonian immigrant Michael Mvogo, served a jail sentence for drug possession but was later arrested and held by the CBSA for more than seven years. On Tuesday, Public Safety Minister Ralph Goodale said he was "concerned" about the recent deaths, and suggested more scrutiny of the CBSA may be coming. "The government is examining how best to provide the Canada Border Services Agency with appropriate review mechanisms," a statement from his office said. According to the Toronto Star, Canada detained 8,519 people who violated immigration law in 2013. On average, detainees remained in custody for 23 days, but 58 people were detained for more than a year. Four of those individuals had been in jail for at least five years. A 2015 report from the International Human Rights Program at the University of Toronto's Faculty of Law, states that nearly a third of detainees were placed in facilities meant for criminal populations. The report argued that Canada's detention of migrants with mental health issues constitutes "arbitrary detention," which violates international laws such as the International Covenant on Human Rights. "It's difficult enough as it is," said Abeer Majeed, a family physician in Toronto who came to Canada from Pakistan with her family as a child. "But to be detained is just another level of violence that shouldn't be happening." Despite Canada's reputation for being friendly to refugees, affirmed most recently through Prime Minister Justin Trudeau's effort to resettle thousands of Syrian refugees, activists say there's more to the story. "We're letting 25,000 immigrants in and we feel good, but this isn't a feel-good story," said Walter Buckwalter, 68, who lives in Toronto and attended the vigil. "It's not the Canada some people think it is."